I was seeing a chiropractor for upper back and neck pain. after my last adjustment to my neck it really hurt and almost instantly I had ringing in my ears and felt sideways that subsided after a month. now the pain is back even worse. so I went to a new chiropractor. he took 2 xrays but said it'll be 2 days before he gets them back, in the meantime he used the proadjuster to determine what was out. he said the c1 atlas. I decided to hold off on having him use the machine until we get the xrays back. the next day I got a massage and by that evening my right arm especially started to tingle and later the left but not as bad. Both arms almost instantly go numb when I lay down. The tingling in my right arm goes down the back of my arm into my pinky. I go back to the chiropractor to review x rays and get adjusted by the proadjuster on Monday but I'm terribly scared to have my neck messed with since the last time. Is the proadjuster safe especially on the neck? can the c1 being out cause that kind of tingling numb and headaches? any insight would be greatly appreciated. I thought Newark was in New Jersey; must be another. Fraid I've never heard of the proadjuster, so I can't comment. The atlas subluxation, C1, is indeed a frequent cause of headaches, though there are many other causes obviously, from the jaw joint to high blood pressure to ... Indeed must be adjusted with care. A fragile part of the body. It's always best to shop around before going to a new doctor, chiropractor, dentist, lawyer... talk to friends, family and colleagues. Half of them graduated in the bottom half of the class remember! My apologies, I'm not being serious. 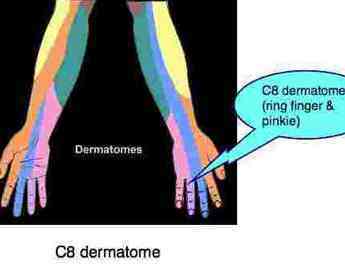 Pain down the arm is a worry; it's following the C8 dermatome from the bottom of the neck. If you turn to the side and look up does it immediately radiate down your arm? Use the search engine at Chiropractic Help to find the Upper Limb Tension Test. Do it, and let me know the result.